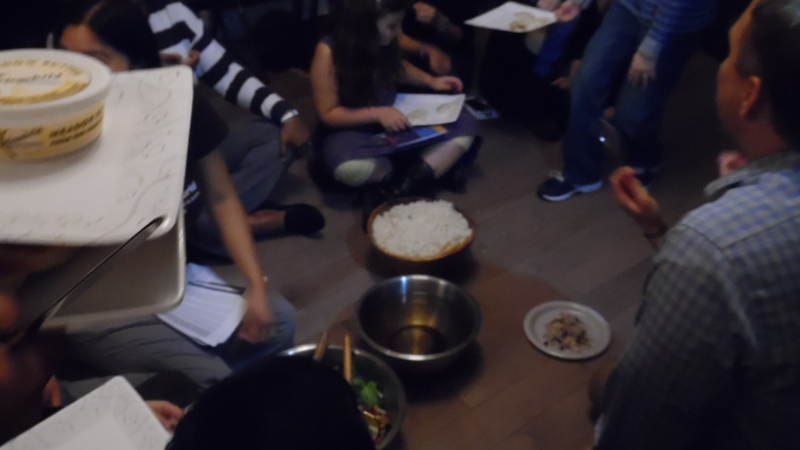 As guests enter a Hunger Banquet they are asked to pick a ticket from a basket. Those tickets describe hypothetical people all around the world, divided into the high-income group (about 15-20% of the total), the middle-income group (about 30% of the total), and the low-income group (about half the participants). These represent the global demographics of rich, middle and poor. Several Oxfam Action Corps volunteers shared the emcee role, and I got assigned the “musical chairs” section. So I promoted a few of our low-income participants to the middle, and demoted a few middle-income participants to the bottom. They were good-natured about it, even though being demoted means giving up a chair to sit on the floor. 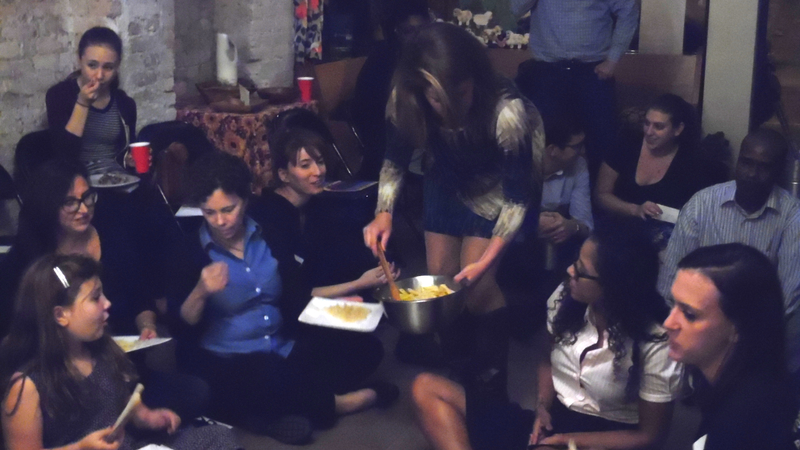 At a Hunger Banquet, the low-income participants sit on the floor. Yes, we make the low-income participants sit on the floor! The middle group gets chairs, and the high-income group gets chairs around a table. When the introduction is complete, dinner is served. As with the seating arrangements, the differences are stark. The high-income group gets pasta with tomato sauce, a salad, bread and butter, and a nice drink. The middle-income group gets rice and beans and clean, clear water. The low-income group gets rice and our own special “dirty” water (not actually dirty, entirely safe to drink, but made to look authentically dirty and gritty); they don’t get dishes or utensils. I was self-assigned to the kitchen, and for convenience the high-income group was seated close by to make serving easier. So I had a perfect opportunity to hear the discussion at the table. People at the high-income table wonder what the others are doing. Startled silence from me and Jennifer, the one Action Corps member sitting at the high-income table. We’ve had people ask this before, but never so early. The question, if it is asked at all, usually comes about half-way through the dinner portion, when the high-income folks realize that there is more than enough food for them, but the low-income people have only rice–and no utensils! Jennifer said that the rules were fairly open and they were permitted to share if they wanted. “Well then, let’s share,” somebody said. And the whole high-income table got up from their seats and went to the middle of the room, where the low-income people were still trying to figure out how to share their pot of rice without bowls or utensils. When we discussed it at the end of the event, one of the low-income participants said, “They just swarmed us!” High-income participants at the table swooped down carrying bowls of pasta, sauce and salad, plates of bread, plates and utensils. They proffered bowls or spooned food directly onto plates. Because the amount of pasta we’d prepared was predicated on a small percentage of the total attendees it ran out, so some low-income participants got tomato sauce spooned over rice. They stretched out the salad and bread as much as possible. People from the high-income table serve the low-income group. Me? I watched in amazement from the kitchen and almost forgot to get some food for myself. 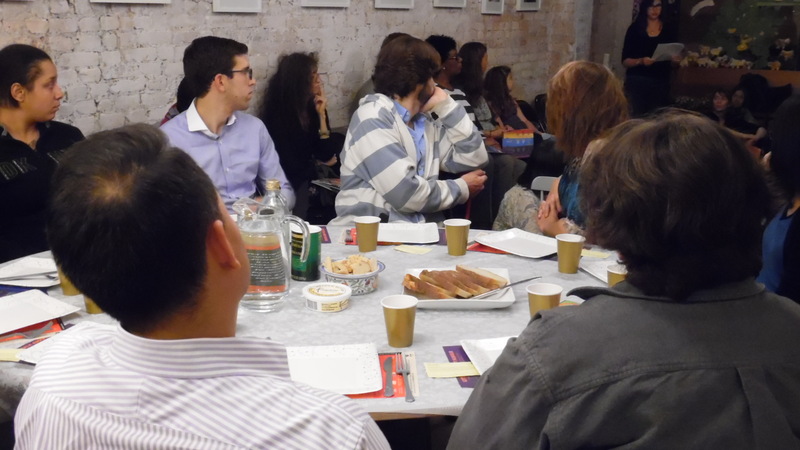 This was my fourth Hunger Banquet (one as an attendee, three as an Oxfam volunteer) and I’d never seen anything like it. Neither had any other Oxfam volunteer. Eventually I grabbed my camera and took a few photos, then took a little food. What If the Rich Rebelled? Ever since witnessing this most unusual Hunger Banquet I’ve been wondering: What if the wealthy rebelled? What if, instead of the poor and hungry demanding a fair share of the world’s food, the well-off demanded that their consciences were relieved by sharing the bounty? Of course the world’s problems are not as easy to solve as this. For one thing, rich and poor rarely sit (physically or metaphorically) so close together. It’s not as easy as standing up from the table and walking across the room. The poor and hungry are often hidden from our view. Homeless people on the streets of New York City, many of whom are mentally ill, can appear scary. And many of the world’s poor and hungry live in places like Syria and Afghanistan, which aren’t safe to visit. The logistics of hunger relief are more complicated than a Hunger Banquet in a storefront church in Brooklyn. But are they impossible? No. One thing we can all do is speak up. Every great social movement started with a few people who questioned the fairness of the status quo. Sometimes it takes years, even decades, before that changes and justice is done, but it starts with a question. “Just what are the rules? Who made them and why do we have to obey them if they are unjust?” That’s essentially what happened at our Hunger Banquet, and minutes later everything had turned upside-down. The rich were serving the poor. Perhaps this is what the inventor of Hunger Banquets had in mind all along? I’m still working out the finer points of what this means, trying to get past the metaphors that don’t scale from a group of 50 people to the world’s 7 billion. (You could say this has pushed my Circle of Ignorance a bit farther than usual.) What are the questions I need to ask? What’s been bugging me that I need to speak out about? And you? What’s the question you’re dying to ask, the injustice you want to point a finger at? Huge thanks to St. Lydia’s Dinner Church for hosting us! And special thanks from me for the opportunity to cook on their gorgeous induction cooktop; if I could I’d have taken it home in my tote bag. I’ll gladly cook for you again!